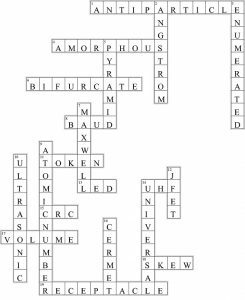 The answers to the Circuit Cellar 318 crossword puzzle are now available. Here are the answers to the four EQ problems that appeared in Circuit Cellar 318. Can you describe some of the pros and cons of each of these choices? A 0-address machine is also known as a “stack” machine. All operators take their source operands from the stack and place their result on it. The only instructions that contain memory addresses are the “load” and “store” locations that transfer data between the stack and main memory. Pros: Short instructions, no implicit limit on the size of the stack. Cons: More instructions required to implement most computations. Parallel computations and common subexpressions require a lot of “stack shuffling” operations. In this type of machine, the ALU output is always loaded into an “accumulator” register, which is also always one of the source operands. Pros: Simple to construct. Eliminates many of the separate “load” operations. Cons: Requires results to be explicitly stored before doing another calculation. Longer instructions, depending on the number of registers, etc. This type of machine allows the two source operands to be specified independently, but requires that the destination be the same as one of the source operands. Pros: Allows more than one destination, eliminating more “move” operations. This type of machine allows all three operands to be specified independently. Pros: Most flexible, eliminates most data moves. To summarize, the short instructions of the stack machine allow a given computation to be done in the smallest amount of program memory, but require more instruction cycles (time) to complete it. The flexibility of the 3-address architecture allow a computation to be done in the fewest instruction cycles (least time), but it consumes more program memory. Problem 2: In order to be generally useful, a computer ISA must be “Turing complete”, which means that it can — at least theoretically, if not in practice — perform any computation that a Turing Machine can do. This includes things like reading and writing data from a memory, performing arithmetic and logical computations on the data, and altering its behavior based on the values in the data. Most practical computers have relatively rich instruction sets in oder to accomplish this with a reasonable level of efficiency. However, what is the minimum number of instructions required to achieve Turing-completeness? Answer 2: Just one instruction, chosen carefully, is sufficient to achieve Turing-completeness. One example would be the instruction “subtract one from memory and branch if the result is not zero”. All of the operations of an ordinary computer can be synthesized as sequences of these “DJN” instructions. Note that since there is only one choice, there is no need to include an “opcode” field in the coding of each instruction. Instead, each instruction simply contains a pair of addresses: the data to be decremented, and the destination address of the jump. Answer 3: The key concept in procedure-oriented languages like C is that of function composition. This means that it must be easy to produce new functions by combining calls to existing functions, and that functions can be called in the process of building argument lists for other functions. The C language takes this to the extreme, in the sense that every operator &mdash including the assignment operator — creates an expression that has a result value that can be used to build larger expressions. Therefore, one key architectural element is the ability to create function contexts — sets of parameters, local variables and return values — that can be “stacked” to arbitrary levels. In terms of an ISA, this means that it must support the direct implementation of at least one data stack that includes the ability to index locations within that stack relative to a stack pointer and/or a frame pointer. This concept is a direct abstraction from the hardware addressing modes of the PDP-11 minicomputer, the machine on which the first versions of C were developed. The PDP-11 ISA allows any of its 8 general-purpose registers to be used to address memory, with addressing modes that include “predecrement” and “postincrement” — implementing “push” and “pop” operations as single instructions — as well as “indexed indirect”, which allows local variables to be addressed as an offset from the stack pointer. Problem 4: Sometimes a computer must work on data that is wider than its native word width. What is the key feature of its ISA that makes this easy to do? Answer 4: The key feature in an ISA that allows arithmetic and shift operations to be extended to multiples of the processor’s native word width is that of a “carry” status bit. This bit allows one bit of information to be “carried” forward from one instruction to the next without requiring extra instructions to be executed. For arithmetic operations, this bit remembers whether the instruction operating on the lower-order words of the operands resulted in a numerical “carry” or “borrow” that will affect the instruction operating on the next-higher-order words. Similarly, for shift and rotate instructions, this bit remembers the state of the bit shifted out of one word that needs to be shifted into the next word. Linear Technology Corp. recently introduced the LTC2320-16 16-bit, 1.5-Msps per channel, no-latency successive approximation register (SAR) ADC. 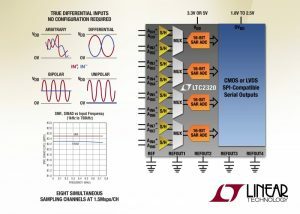 Featuring eight simultaneously sampling channels supporting a rail-to-rail input common mode range, the LTC2320-16 offers a flexible analog front end that accepts fully differential, unipolar or bipolar analog input signals. It also accepts arbitrary input signals and maintains an 82-dB signal-to-noise ratio (SNR) and high common mode rejection ratio (CMRR) of 102 dB when sampling input signals up to the Nyquist frequency. The LTC2320-16 is available in commercial, industrial, and automotive (–40° to 125°C) temperature grades. Pricing begins at $16.50 each in 1,000-piece quantities. The DC2395A evaluation board for the LTC2320 SAR ADC family is available at www.linear.com/demo. 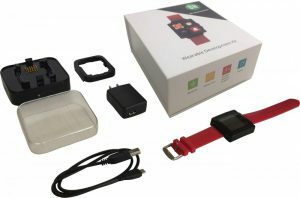 Valencell and STMicroelectronics recently launched a new development kit for biometric wearables. Featuring STMicro’s compact SensorTile turnkey multi-sensor module and Valencell’s Benchmark biometric sensor system, the platform offers designers a scalable solution for designers building biometric hearables and wearables. 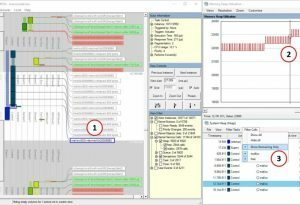 Percepio AB recently released Tracealyzer 3.1, which is a trace tool that supports RTOS trace using just a standard USB cable. You can increase your development speed by using Tracealyzer for debugging, validation, profiling, documentation, and training. The trace recorder library is now easier to configure for streaming over custom interfaces, and includes support for USB streaming on STM32. (It can be adapted for other microcontrollers.) USB offers excellent performance for RTOS tracing and over 600 KB/s has been measured on an STM32 using USB 2, several times more than required. Other stream ports include TCP/IP and SEGGER J-Link debug probes. Tracealyzer 3.1 can also receive trace streams via Windows COM ports (e.g., from USB CDC connections), UART connections, or any virtual COM port provided by other target interfaces. Tracealyzer 3.1 can identify memory leaks in systems that use dynamic memory allocation. It can record memory allocation events (e.g. malloc, free) from multiple operating systems, and it can display such allocations that have not been released. Since the memory allocation events are linked to the task trace, you quickly find the context of the allocation and investigate the problem. The recorder library simplifies integration and now provides a common API for both streaming and snapshot recording. Mouser Electronics how has two new Texas Instruments development kits in stock: the CC1350 SensorTag development kit and the sub-1-GHz and 2.4-GHz antenna kit for LaunchPad and SensorTag. Designed for low-power wide area networks (LPWAN), the CC1350 features dual-band connectivity that expands the functionality of a sub-1 GHz network with Bluetooth low energy (BLE) implementations.The sub-1 GHz and 2.4 GHz antenna kit for LaunchPad and SensorTag enables you to perform tests to determine the optimal antenna for applications. Expands the SensorTag ecosystem with a single-chip Bluetooth Smart radio and a sub-1-GHz radio. 16 tested and characterized antennas for frequencies from 169 MHz to 2.4 GHz, including PCB antennas, Helical antenna, chip antennas, and dual-band antennas for 868 or 915 MHz combined with 2.4 GHz. A µSMA (JSC) cable to connect to LaunchPad and SensorTag kits, including the CC1350 SensorTag development kit, as well as the CC2650 LaunchPad and CC1310 LaunchPad. STMicroelectronics’s miniature SensorTile sensor board of its type comprises an MEMS accelerometer, gyroscope, magnetometer, pressure sensor, and a MEMS microphone. With the on-board low-power STM32L4 microcontroller, the SensorTile can be used as a sensing and connectivity hub for developing products ranging from wearables to Internet of Things (IoT) devices. The 13.5 mm × 13.5 mm SensorTile features a Bluetooth Low-Energy (BLE) transceiver including an onboard miniature single-chip balun, as well as a broad set of system interfaces that support use as a sensor-fusion hub or as a platform for firmware development. You can plug it into a host board. At power-up, it immediately starts streaming inertial, audio, and environmental data to STMicro’s BlueMS free smartphone app. Software development is simple with an API based on the STM32Cube Hardware Abstraction Layer and middleware components, including the STM32 Open Development Environment. It’s fully compatible with the Open Software eXpansion Libraries (Open.MEMS, Open.RF, and Open.AUDIO), as well as numerous third-party embedded sensing and voice-processing projects. Example programs are available (e.g., software for position sensing, activity recognition, and low-power voice communication). 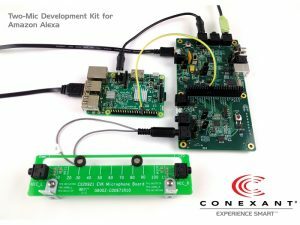 The complete kit includes a cradle board, which carries the 13.5 mm × 13.5 mm SensorTile core system in standalone or hub mode and can be used as a reference design. 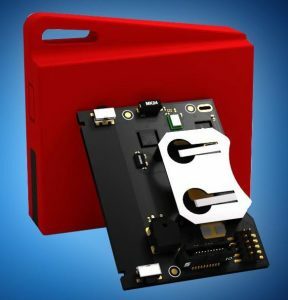 This compact yet fully loaded board contains a humidity and temperature sensor, a micro-SD card socket, as well as a lithium-polymer battery (LiPo) charger. The pack also contains a LiPo rechargeable battery and a plastic case that provides a convenient housing for the cradle, SensorTile, and battery combination. Cradle/expansion board with an analog audio output, a micro-USB connector, and an Arduino-like interface that can be plugged into any STM32 Nucleo board to expand developers’ options for system and software development. Incorporates the ARM CryptoCell-310 cryptographic accelerator offering best-in-class security for Cortex-M based SoCs. Extensive crypto ciphers and key generation and storage options are also available. Nordic released the S140 SoftDevice and associated nRF5 SDK with support for Bluetooth 5 longer range and high throughput modes in December 2016. Engineering samples and development kits are now available. 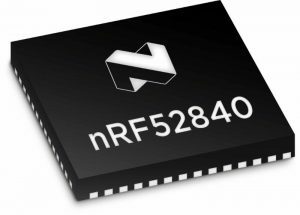 Production variants of the nRF52840 will be available in Q4 2017. 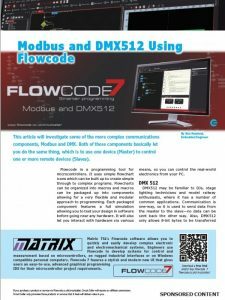 In the first article in this series, you were introduced to Flowcode 7, flowchart-driven electronic IDE that enables you to produce hex code for more than 1,300 different microcontrollers, including PIC8, PIC16, PIC32, AVR, Arduino, and ARM. The second article detailed how to get working with displays in Flowcode. This article will investigate some of the more complex communications components, Modbus and DMX. Both of these components basically let you do the same thing, which is to use one device (Master) to control one or more remote devices (Slaves). Access the third article.